Last month (wow… I am embarrassed, heavy snow and power outage aside…) Kristi of Thankful Me honored me with a Leibster. … and I’m okay with that. I was preppy before it had a name. Izods/golf shirts/polos by any name have always been a wardrobe staple. I lettered in tennis, track and cross country in high school. … and allows me to eat dessert early, often and a lot. I love DARK chocolate, but am not much on chocolate milk, milk chocolate, hot cocoa, or garden-variety chocolate cake. Cilantro really makes me happy. If I have to have a new career, I want to be a weather girl. Zero accountability with a wardrobe budget? Sign me up! I’m fickle, indecisive and otherwise reserve the right to change my mind… except when I don’t have that option. I believe fire trucks should be red. Sure, white, yellow, green, black, etc. can be pretty, but cabs should be yellow, fire trucks should be red, and hearses should be black. Now, for Kristi’s questions. My answers are in red. 1. Which would you rather have, 20 chickens or 1 goat? One goat. While I love roosters and fresh eggs, terriers and small animals are a BAD idea. 2. Would you rather travel back in time or forward in time? Tough question. Will my iPhone work in 1776? 3. If you had unlimited resources, where would you like to vacation, and what would you do? 4. Would you rather sleep in or stay up late? I’d rather stay up late. I’m not good at sleeping in, nor is Gretchen. 5. Which major would you choose if you were to attend college now? Despite my snarky comment above, I think I’d still go with philosophy again. 6. If you could visit (or live in) any make-believe land from literature, which would you choose? Just one?! Gretchen votes for a visit to Hogwarts, and that works as well as anything else. 7. It’s nearly dinnertime, and you forgot to plan. What do you have for dinner? We eat out a LOT. In a pinch, the Knight makes his pasta stuff or I make a pizza. 9. What is one character trait you admire? 10. What are the biggest influences in your life? My family, all the “pioneer” women who braved equality first… most without knowing they were blazing trails. 11. Do you still live in your hometown? If not, how far away do you live? I live in the same general area where I was born and lived the first 11 years of my life. The other town I consider tied for hometown status is all of 90 minutes away. What is the must-see place in your town? Are you City Mouse or her country cousin? Do you have a favorite charity/non-profit? What song is the theme song to the soundtrack of your life? … but I am grateful that Terrie of Starspry included a translation with her explanation of the Liebster award. 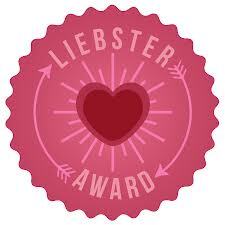 Liebster is a German word meaning favorite, dearest or beloved. The Liebster Blog Award is awarded by bloggers to other bloggers who have fewer than 200 followers, to help spread the word about their blogs and to help them gain wider recognition. 3. Give the award to 5 bloggers with less than 200 followers. 5. List 5 random facts that people don’t know about you. Well. I’m an open book, so what on earth can I share that you don’t know… and might possibly find entertaining?! These lists are HARD for me. While I can write/speak at length on any subject going, ask me about myself and I go mute. It’s not humility. I can go on and on about my strengths and weaknesses; I just don’t think I’m remarkably interesting. I obviously have unreasonable standards for customer service, and yet when it comes up in conversation, my opinions seem mainstream. That customer service comment? That’s for you, local Old Navy. I really wanted these shoes, but no one was working the cash register, so it would seem. I carried TWO PAIRS around the store, because the only pair my size didn’t have a tag, and because I almost never go in said store, I wanted to see what I could see. Then, there was no one at the registers. Only one light was on, so I stood near there, and paced. And looked like I wanted to check out. And paced… and got cranky and slammed the shoes on the counter, walked almost the width of the store to the door, and no one noticed. Hrmph. Still trying to decide whether to order then online or not…. Yesterday was Thomas Jefferson’s birthday. I wonder how he would feel about us celebrating more than two centuries after his birth? The world, especially the USA, is definitely a better place because he lived, but I’m not at all sure he’d like everyone honoring his birthday. What do the other amateur Jefferon scholars think? I also couldn’t resist making sure you’ve seen this Peeps wreath. I am no fan of the sugary creations that now are formed into shapes and dyed different colors to mark virtually every holiday or season known in marketing, but I am still pondering making a wreath out of them. Would the birds that hang out on our front porch attack it? Well! WordPress and/or Comcast just ate a significant chunk of my post. Crazy, that… I guess here ends the Peeps babble. There’s a tutorial in the link above or you can click on the photo. We’re also still celebrating Christmas. I was able to upload the photos from my phone while driving into work this morning. Luckily, there are a few stoplights and stopsigns in podunk! Hem. Here are the goodies from Ann! There’s some yummy Gnomespun fiber , snarkly little cocktail napkins, because Ann knows I carry off-season, silly cocktail napkins in my League bag. Don’t judge; you never know when you’re going to need a little napkin! The little cream-colored sack on the right is Beekman soap. More yum. Last, but hardly least is the book Knit Your Own Dog! I’ve wanted this book since the first time I heard about it from a friend abroad. 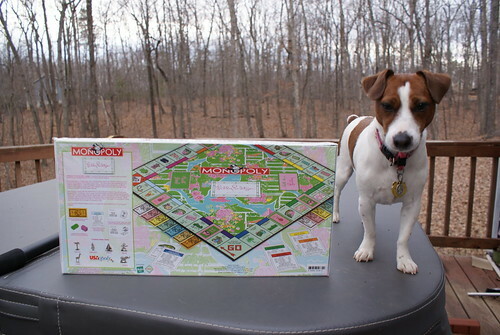 There’s the Jack Russell on the cover, and there’s a basset in there too. There are 25 different breeds represented in the table of contents. 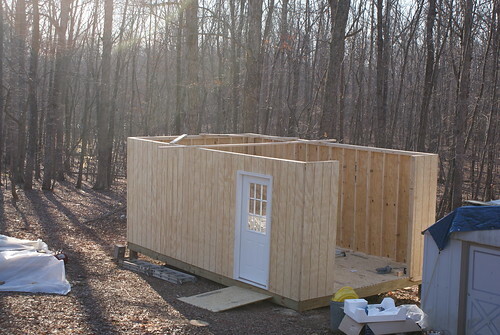 They include a PWD and a Scottie, since we know a couple of our best blog readers will want to know. Thank you for another spectacular package, Ann. That’s actually my Thankful Thursday moment; I’m blessed to have friends who truly know me well and whose gifts NEVER fail to delight me. Last but hardly least, I have to thank Dawn for the Stylish Blogger Award love. I received the award earlier this year, so I’m not going to pass it along again to anyone specifically, but we’re all stylish bloggers, so if you want to share 7 things about yourself, consider yourself tagged. I ALWAYS get the same thing when I eat at/from Sticks. Ann and I kinda’ founded our “in person” friendship there, and that’s where Tuesday’s lunch came from. Lambie sammie with the cilantro-lime sauce and an order of fries, please! It seems I gravitate to tealish-bluish handbags. I want these sandals just because they’re called Sissy. I don’t like necklaces much, but I love a scarf around my neck. I don’t have a favorite color. It changes from day to day, season to season. How ’bout sharing something I don’t know about you in your comment? It’s been a while since I’ve had a mega-post, but I’ll be making up for lost time today. Stop now and grab some refreshments, settle into a comfortable chair, and read on about my exciting weekend! To kick our gala weekend off, Nichole awarded me the Stylish Blogger Award. Gretchen made me clarify that Nichole did indeed mean for it to go to this blog, not theirs… Hem. Thank you, Nichole! Now, to share seven things you may not know about me. Really?! I don’t know that I have seven left. I’ve been blogging long enough that I seriously feel I’m an open book. Since it’s Presidents Day here in the USA, while George Washington is the first of many “Virginian” presidents, my favorite is the very local Thomas Jefferson. Along those same lines, there’s more than a fair chance that James Monroe once owned the land that is now our Haddon Wood. I need help thinking of a new name/address for this blog. Chan doesn’t knit so much, and honestly, I’d rather not have my name in the blog addy. As much as I love the beach, I don’t swim in the ocean. Too hard on my tender back. Surprisingly, high heels don’t bother my back. I don’t wear them daily, but when I do wear them, they hurt my instep first, and usually enough that they come off before my back can start to hurt. Don’t tell my chiropractor, but I’m doing yoga again. This time, I’m going to stick with the gentle stuff on the Wii Fit Plus – I figure if it’s safe enough for them to share with the public… – and the back routine that served me well for the first ten years after my surgery. I’ve lost a bit of weight and my sweet tooth. Saturday night, I honestly couldn’t find a single food item that appealed to me. …. so I had two glasses of Prosecco, won some earrings from the bubbly bar, and that pretty well sums up how awesome my evening was! What do you mean it's not mine?! I also brought home a “basic training” gift certificate. While the DIVA’s feet are present (maybe she saw the purple and just assumed…?? 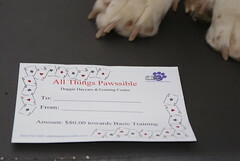 ), I need to confirm the terms of the certificate, but I think the wee one is going to go to basic obedience class. Do y’all think the DIVA would enjoy an intermediate class, even though I know she’s not likely to ever obey “down” or hold an out-of-sight stay? 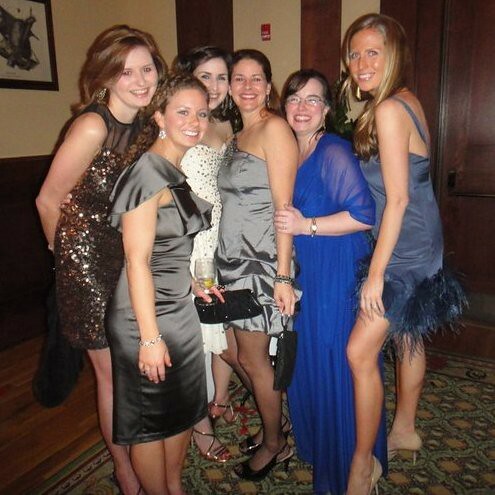 There are tons more, but they’re all rather similar… a bunch of girlfriends, laughing, being silly, having a great time! 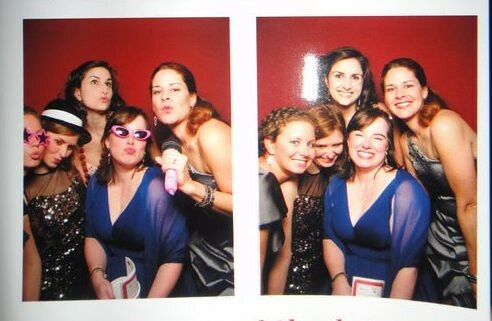 If I had to be dateless, I couldn’t have had a better group to hang with. Thanks also to their sweet hubbies and a fiance for snapping photos, holding my bag and bucket and escorting me in from the rather remote parking area! 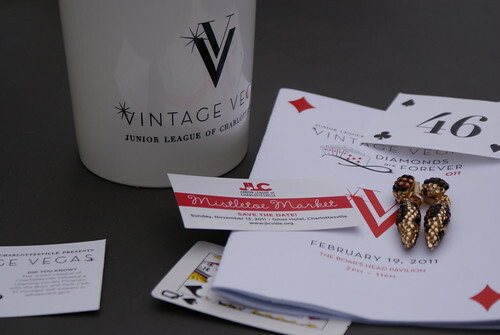 I still have a very special package to share with you tomorrow, but really… isn’t this enough for one post?! Barbara, who has both style and class and a great blog! Mango and Dexter, because frankly, Sissy and Gretchen would never forgive me if I didn’t give a nod to them for their style and friendship! I do love America, the Beautiful. It’s a lovely, patriotic song. Since I don’t have sound on my computer at work, I’m humming loudly. Luckily, Uncle is patriotic and used to my strange habits. I’m late blogging today because I was slow doing invoicing because Best Thing (refresher: Neighbor Guy’s fiancee) sent me the coolest link this morning. I’m proud to announce I got 90% on the first try, and my highest score is a 96%. Let me know how you do, or as Best Thing did, she informed me that she played once, got what we’d call a passing grade if we were still in elementary school, but she doesn’t REALLY adore trying to place the outlines of states into the outline of the continent. I do. You see, while Best Thing and I agree that books are the best toys for girls and boys of all ages, I had a beloved, wooden puzzle map that was a shared podunk toy from one of the farms in the area where the kiddos were significantly older. Anyhoo, that’s all great fodder that allows a punny segue to a special award Bridget bestowed upon me, whether I am worthy or not. My hair has a mind of its own. It was rather straight until my late teens, and has been getting progressively wavier ever since. Sushi and I are not friends. I feel this is a big gap in my culinary experience, but I’ve not been able to bridge it. The interesting well is dry. That is noteworthy because I’m rarely at a loss for words. I’ve never watched a full episode of any reality show. I just don’t find them entertaining. Another lull. Hmmm… I don’t care for brazil nuts. I do believe they’re the only nut I don’t adore, while the Knight and his mother rank them as a favorite. I don’t like spanish rice. I’m a glass half full kind of gal, so it irks me that the theme of this list seems to be “I never” and “I don’t”. 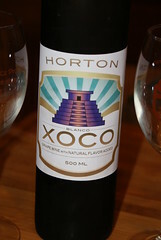 Any of you who’ve read one of my swap questionnaires know I ADORE dark chocolate, so imagine my surprise when I discovered that the new white chocolate wine from Horton Vineyards is better than the original! Next, I need to pass the award along. While so many of you bring so much beauty to my life, I’m going to share this with some new to me bloggers that I need to be sure you know about too! Barbara at Moveable Feasts has become a cherished friend, but it was her recipes and photos that pulled me in. 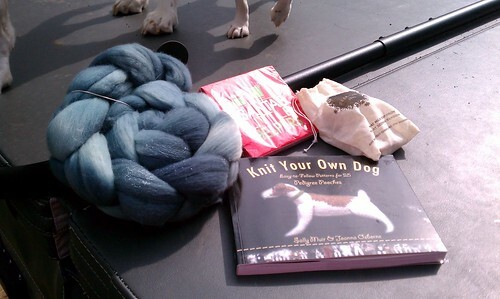 Dog-Lover’s Yarn has beautiful dogs, spinning advice, fabulous photos. You also needed to see the text on the back side of the glass. 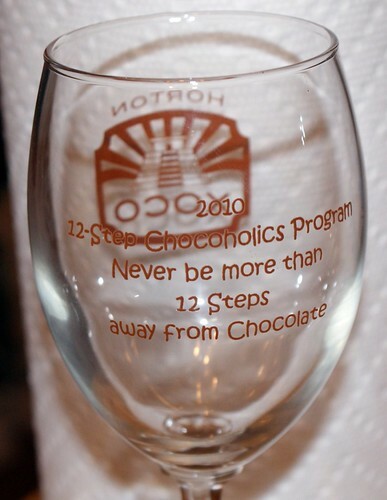 Every year, the Hortons include a new glass, with a fun saying on one side. This year’s was spot-on; I just wish I’d been able to get a better photo for you! I think I need that on a coffee mug, a tea cup, a tee shirt, a night shirt… How ’bout you? Thank you, Dawn! Can’t you just see the March winds blowing spring my way? 6. 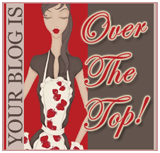 Leave a comment on your nominated blogs to let them know. I worked for a dentist on Saturdays in my teens. I wanted to be an attorney for several years, growing up. I also seriously considered becoming a nun for a very short while. I wanted to go to the Naval Academy and fly jets, but back in the day, girls didn’t fly jets. I love public speaking, but hate the telephone. I don’t text. I have a Blackberry, so just email me! I don’t like lemon-flavored baked goods. I’m not going to tag seven new people, but I hope seven of you will play along! 3. Your mother? Will be 70 this year. Somehow, that surprises me. 4. Your father? Miss him every day. 28. Your favourite store? For what? 34. One person who emails me regularly? comment-reply@wordpress…. Thanks, Bridget! That was fun. I’m supposed to pass this along to six other worthy bloggers, who may or may not want to play along. As most of you know, I usually wig out about here, and just invite anyone who needs blog fodder or feels so inclined to participate to play along.